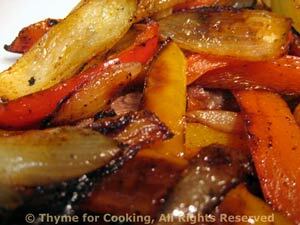 Roasted Peppers and Onions, Thyme for Cooking simple, seasonal recipes. A simple side dish that pairs well with grilled meats. You can vary the ingredients according to the rest of the meal: adding paprika, garlic, dried herbs, using vinegar, lemon or Worcestershire or soy sauce; adding ketchup or mustard... Very flexible. Slice peppers and onion about 1/3" (1cm) thick. Put olive oil and soy sauce in a large bowl, add pepper and onion, toss well to coat. Put into 'grill pan' (a metal or foil pan dedicated to use on the grill) or onto a mesh grill pan (the idea is not to have the stuff fall through the grate into the fire....) Cook over medium heat 10 - 15 minutes, until they have a nice color. Or you can sauté them in a nonstick skillet for about the same amount of time.